Golf Betting 101 - Betting Golf For Dummies and err.... You! Even if you don’t know it yet, the links can be absolutely littered with cash for you. Sitting at home on the couch and flipping through all of the channels you may pass by the Golf game. In the 2 seconds you see a green lawn and a guy whacking a tiny ball, you may think to yourself..
Oh, but not so fast my friend! There are reasons that between 13 and 14 million people are watching it every year. Golf is an exciting sport for a lot of reasons. Whether you watch it or play it, you are enjoying a pastime that has been around in one form or another since ancient Roman times. Golf brings together the beauty of nature with socializing and competition. While it is a “quiet” sport in many respects, that quiet and stillness is suffused with the tension and anticipation before each shot. Because golf is so thrilling to watch and play, is also exhilarating to wager on. 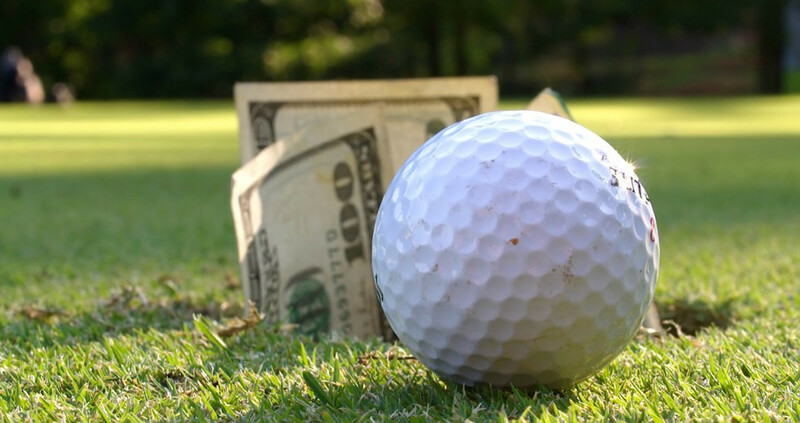 This guide gets you started to bet on golf. We will discuss the types of bets you can place, how to evaluate the impact of a course, mistakes to avoid, and more. I will also share some recommended betting sites for golf. There are plenty of competitive events in golf, but most bettors focus on two big different tours, The PGA Tour and The European Tour. As the name indicates, the European Tour is played mainly in Europe, and takes place in many different countries. The PGA Tour is mainly played in the US. Both tours however also travel to other continents like Asia and Africa for some of their matches. For some intense golf wagering action, check out Intertops Casino! Also, be sure to read our in-depth guide on Where to Bet on the Masters with or without bitcoin in 2019. So if you are going to begin betting on golf, following these major tours and tournaments is a good starting point. You will find the most betting opportunities, and it will also be easier to conduct your research and learn your own strategies. But there are also numerous smaller golf events which you can wager on throughout the year. These events do not get nearly as much publicity, and not all betting sites offer action on them, but they do give you something to follow and profit on when you are waiting for major events to roll around. Plus, if you become an expert in golf, you might find some good odds with these events since betting sites will spend less time handicapping them. Now you know some different golf events you can wager on. Next, it helps to know what types of bets you can place. More than likely, this will be the first type of golf bet that you will ever place. It is simply a wager that a certain player will win a match. This is the opposite of a “to win” bet. It is where you are wagering that a certain player will not win a match. It does not matter who actually wins the match, so long as it is not that golfer. If that golfer loses, you when your bet. Typically, this type of wager will only be offered on a golfer who looks extremely likely to win. So it is a risky bet, but it can pay off if you are correct. When you wager ahead of time on the outcome of the entire tournament season, and not just on what will happen during the course of a single match, you are placing a golf futures bet. When you do not know who is likely to win a golf match, but you are pretty sure that a certain player will beat one of his adversaries, you can place at head-to-head bet. Even if both players do not make it anywhere near the top of the rankings, you will win so long as you correctly predicted which one would come out ahead of the other. As with other sports, there are many different types of proposition bets which you can place on golf matches. You can bet on anything from the age or nationality of the winner of the tournament to whether or not a certain player will make a hole-in-one. Many prop bets are “just for fun,” but in some cases, you might be able to profit from your specialized knowledge. One thing which sets golf aside from most other sports is the extreme amount of variance in the grounds on which it is played. While there is some divergence in the fields and courts used for other sports, it is not nearly as dramatic. Different golf courses literally shape the game in different ways. There are also other environmental factors to take into consideration as well. What types of grass have been used for the fairways and greens on this course? What experience and preferences do the players competing have with respect to the grass? How long are the fairways? Does the course cater to big hitters? How forgiving of mistakes is the course? Is it difficult to get out of the rough? Are there many obstacles along the way? How will wind move through this course? Is it a breezy location? Does the wind tend to blow from a single direction, or is it unpredictable? Is the course located at a high or low altitude? Which golfers competing might benefit? What is the weather like at the golf course? Is it hot or cold? Dry or is it humid? Expected to rain? Will the grass be wet? How will these conditions impact swings? Will they have an effect on visibility? What about on fatigue? How far will most of the golfers have had to travel in order to reach the course? Say you are following golfers on the European Tour. Most of these golfers will be European themselves, so if the course is located in Scotland, the travel to reach it for most players may be minimal. But if the course is located in South Africa, many of the players may be fatigued upon reaching it. You should also consider what the culture at a given golf course is like. The crowds can behave very differently from one location to another. Some players may feel right at home among certain crowds, especially in or near their own hometowns. Others may feel uneasy, and may be distracted by onlookers. What is this golfer’s form like right now? You can take a look at the entire season, but you should put most of the emphasis on the most recent events. How has this golfer performed at this course and similar ones in the past? Take a look at the statistics for the golfer as well as the course. Is there an intersection between the golfer’s strengths and the type of play that the course supports? What is the golfer’s history? Has he participated in this particular tour before? What is the player’s style? Is it a match for the course and the type of event? What is the golfer’s mental state right now? Is he confident? Overconfident? Not confident at all? Distracted by life events? Focused and in the zone? Does he have any key rivalries with other players in the field? What does he have at stake in this particular match? One great thing about golf is that there are great many highly detailed statistics that you can look at both for players and for courses. If you take the time to really delve into the analysis, you should be able to make some solid bets. As with anything new, you should be aware that there are quite a few pitfalls which you should look out for when you begin wagering on golf. Here are some common novice mistakes to avoid all you are betting. This is not something you necessarily need to avoid like the plague, but you should proceed with caution. There is far less information available on new players, and it is difficult to understand contextually how they fit into the field. Placing a lot of wagers simultaneously just because you can. When you have a field of 100 or more golfers in it, and there are a lot of different types of wagers you can place. It is tempting to take a whole lot of bets at once. This is a good way to lose money. If you are really honest with yourself and do the work, you will probably only find a few really strong bets. Take those ones and save the rest of your bankroll for better opportunities. I have already talked extensively about the importance of accounting for the course and the weather, not just looking at the stats for each golfer. Nonetheless, this is such a common mistake that it is worth emphasizing this point. Context is crucial in golf. If you ignore it, you will make bad bets. Be particularly mindful of this when you are making head-to-head bets. Betting only on big names. This is a problem in any sport, but it seems particularly pervasive in golf. Newbie punters often will wager on celebrity names with a lot of hype around them. This is an especially big problem early in the season. Big-name golfers sometimes will under-perform in smaller events because they do not consider them important. If you wager on them simply because of their fame, you may end up losing money. There are a number of other mistakes which can be particularly costly near the start of the golf season. Some of these include overlooking returning players and rookies, forgetting to check if the rule books have been updated since last season, and neglecting the significance of injuries. Another mistake is betting a lot of money early in the season, and blowing it all before there is a chance to wager it on the big tournament events. Putting more emphasis on historical performance than you do on recent form. Both are important to consider, and ignoring either can be a mistake. But in general, recent form will be more predictive of future performance than statistics from years past. Now you have a feel for some of what you should and should not be doing when you are betting on golf if you want to be profitable. So the next question is, “Where can you bet on golf online?” Here are 6 of the top sites which I am recommending for golf betting at this time. This is a good site for betting on the Majors and other important golf events. Currently, new punters who register on Intertops can receive a $200 match bonus on their first deposit. If you are looking to place futures bets on golf tournaments, Bovada is a great site to choose. If you sign up now, you can take advantage of the $250 welcome bonus. Here are the latest golf betting odds listed by Bovada. This online sportsbook offers one of the biggest bonuses around—as much as $2,500. Another reason that we recommended Bookmaker it is that it offers lots of prop bets on golf and other sports. You can place futures bets, prop bets, and to-win bets on GT Bets. On your first two deposits combined, you can receive a 150% match up to a total of $1,000. There are also ongoing bonuses available to loyal customers. Here you will find an assortment of proposition bets as well as to-win bets on golf. If you make your bets on the same day as the events, you may qualify for reduced juice at 5dimes. When it comes to promotions and diverse bet types, MyBookie is one of the best sites out there. When you register to join the site, you can get a 50% match deposit bonus as well as a $20 risk-free bet. Reload bonuses are here as well. Golf bets you can place include futures, 1st-round leader, match-ups, odds to win and specials. Golf truly is unique in the world of sports, and as such, can make for some exciting betting opportunities. If you decide to start following and wagering on golf, do not be surprised if you discover a passion for life. Sign up on a few of the sites I have recommended to take advantage of some excellent promotions and get started betting on golf right away.